The best part about raising koi fish is feeding them! Seeing them come to the surface and even eating from the palm of your hand is the best bonding experience between growing koi fish and their owners. It's said that koi have a memory of around three minutes, yet they can learn to recognize their feeders. Talk about selective memory! We've assembled some great tips to help you become a become your koi's favorite face, even if they're the pickiest koi-nnoisseur. While smaller fish prefer flake food, pellet food shown here is good for larger fish. Koi will even eat people food. They love cereal, lettuce, shrimp, rice, peas, watermelon... pretty much anything we like, koi fish consider food. Avoid feeding your koi fish before storms. Fish need more oxygen when digesting food. When it rains, oxygen levels in the air dip down, so you can see why it's a bad koi fish feeding time. Your growing koi will remember you as their feeder after only a short amount of time. Consistently feed them and they will begin to greet you as you approach the pond. 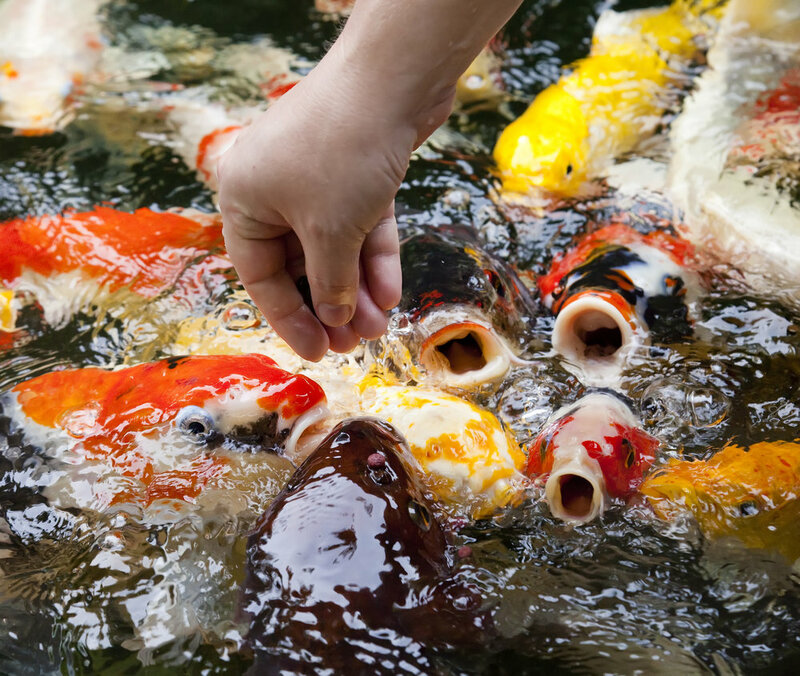 Your koi fish prefer more carbohydrate-rich foods early in the spring and late in the fall while protein is better in early summer when mating is in the air (er, pond). Koi fish feeding time is fun. Enjoy your special time with your beloved growing koi! Koi fish feeding is not recommended if your pump breaks because your koi need oxygen to digest their food.